Come celebrate as we begin the transformation of the New England Aquarium's Giant Ocean Tank! Join us for a celebration of the Aquarium's signature exhibit, the Giant Ocean Tank (GOT), as we kick off its 21st-century transformation. You can mingle, dine and dance during the whole evening’s festivities, or just kick up your heels at The After Party! 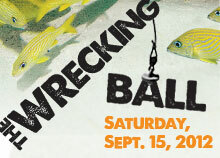 Buy your tickets to the Wrecking Ball and The After Party here. Your purchase will help transform the GOT!